Private Equity (PE) transactions are primarily debt financed. They represent up to 25% of the total M&A. Unlike corporate-strategic buyers (CSB) - they involve temporary capital structures and temporary ownership. They unlikely go to their legal final maturity of 7-10 years. They are either refinanced or sold if they perform well or are restructured if they do not. They reason is their high cost and limited flexibility based on their high debt levels. 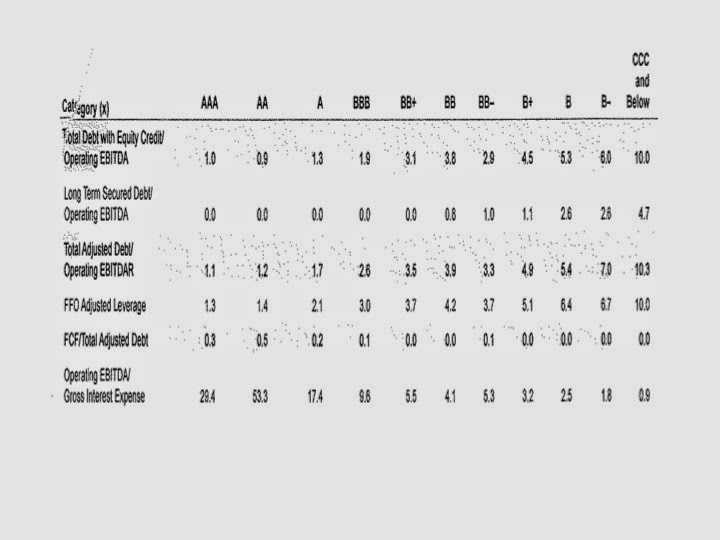 They typically have non investment grade debt ratings in the BB-B range versus CSB investment grade ratings. This is due to their inverted capital structures which are 30% equity-70% debt. CSB capital structures are usually investment grade-in the BBB-A range with 70% equity-30% debt. 1) Their financial preferences concerning cost, risk and flexibility. Lower rated firms face higher financing costs and lower flexibility reflected in covenants and amortization schedules. For example, currently a BB+ leveraged loan has a prorate spread of LIBOR+ 165B, while a B+ spread is in the LIBOR+ 265BP range. 2) Financing need: large needs argue for higher ratings/lower debt levels. The “B” market is smaller and less liquid than the “BB” segment. 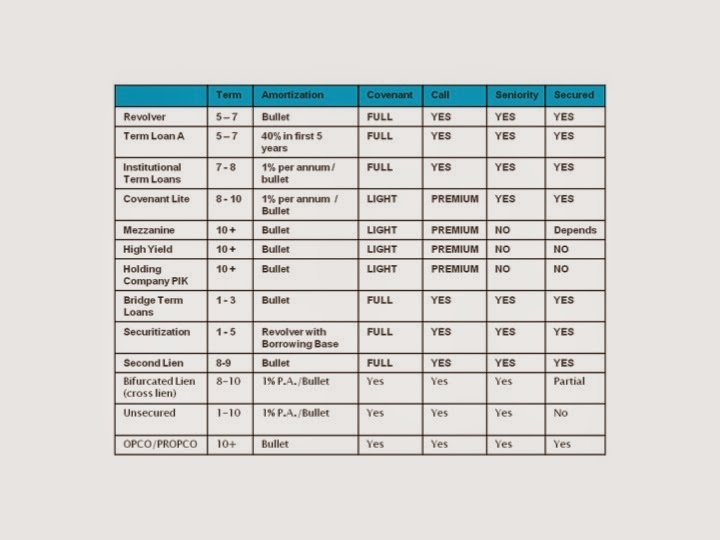 3) Firm specific characteristics concerning leverage levels, cash flow and size. For example, BB+ firms have revenues around $3B and debt to EBITDA of 3X while B firm’s revenues are closer to $1.5B with leverage in the 4.5X+ range. 4) Market conditions: the non investment debt market is very volatile. The market virtually shut down during the financial crisis. This causes a real risk when attempting to fund a transaction with a capital structure designed for a market which has changed. Unlike CSBs- market, not firm factors are the most important determinants of PE capital structures. So for a B+ target and $100 of EBITDA debt capacity is around $500.This would be fined tuned with cash flow projections to develop the debt amortization schedule. Of course, the level changes based on market conditions. 1) Decline the deal: PE firms are, however, under pressure by LPs to invest. Either you invest the LP’s commitment within an allotted time, usually 5 years, or it expires and with it the PE firm’s fees and carried interest. 2) Increase the equity %: this reduces the deal’s IRR. Deal IRRs below target levels reduce the PE firm’s carried interest. Additionally, low overall fund returns complicate future PE firm fund raising efforts. Remember, the deal IRR is the entry equity investment less the exit entry process upon future sale. Assuming the entry PPX equals the exit PPX and no interim dividends-then IRR will fall given increased initial equity unless the target’s EBITDA performance is increased. 3) Reduce the PPX: unlikely in a competitive bid situation. where i is the average interest rate and n is the average debt duration. 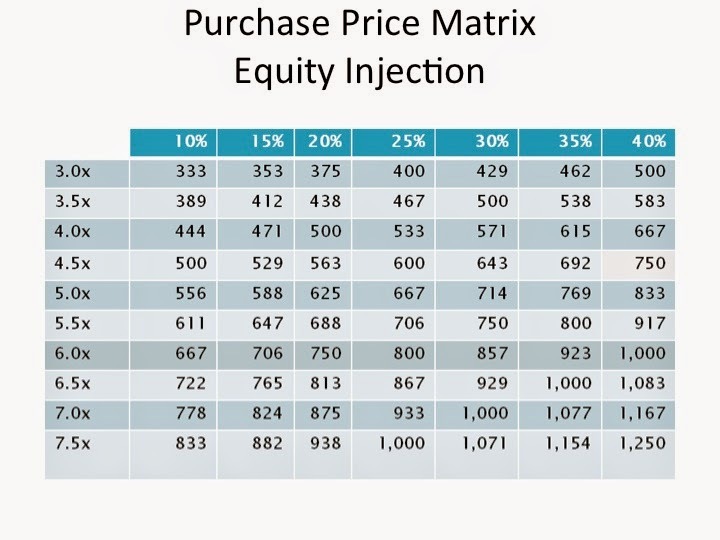 1) PE target demand is driven by financing not price. Demand can actually increase as PPXs increase provided FDXs increase. 2) Both the financing market and target market are volatile, highly pro-cyclical and amplify each other. 3) PE fund returns tend to fall for later stage acquisitions. They continue to over pay and buy late in the cycle, provided funding availability, and suffer the return consequences later. 4) Capital markets have accommodated PE firms by development a suite of debt capacity enhancing products. 5) PE capital structures are non risk adjusted IRR driven. a) IRR: (Entry Equity) + Exit Equity Yr t/ (1+IRR) ^t=0. The internal rate of return on an investment or project is the "annualized effective compounded return rate" or "rate of return" that makes the net present value (NPV as NET*1/(1+IRR)^year) of all cash flows (both positive-exit equity proceeds- and negative-entry equity investment) from a particular investment equal to zero. b) Entry Equity=EBITDA Yr0 X PPX Yr0 - FDX Yr0 X EBITDA Yr0. The initial equity investment outflow is equal to the purchase price defined as trailing EBITDA times the PPX less the amount of debt funding defined as trailing EBITDA times FDX all at the time of close. c) Exit Equity=EBITDA Yr t x PPX Yr t- FD outstanding Yr t (think of Exit Equity value as terminal value in a traditional DCF analysis). Expected net equity proceeds upon sale in year t are the enterprise value purchase price-exit year EBITDA times PPX-less any remaining outstanding debt. PE firms are not stupid or crazy. Rather they have different incentives than CSBs. 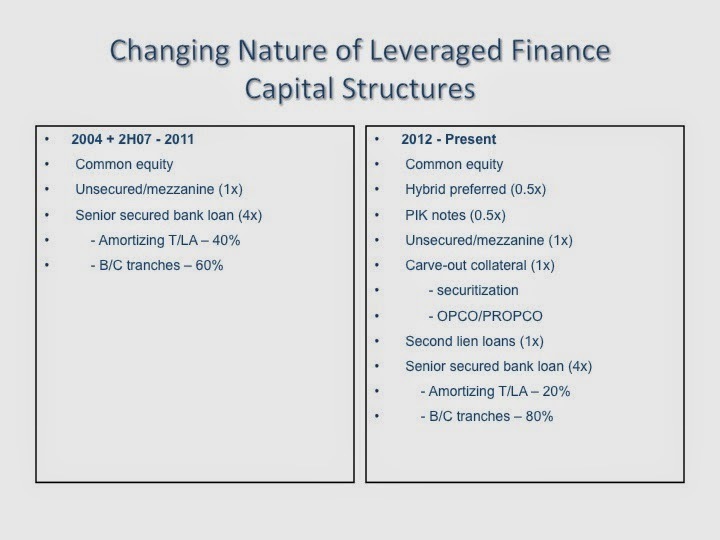 Hence they have different capital structures.